The past year brought with it a host of new changes to the Four Kings Casino. Among the highlights of the year, we released two entirely new games, the all new Emporium store, and revamped the casino’s layout and look. We’d like to thank all of our players for their support and feedback throughout the year. 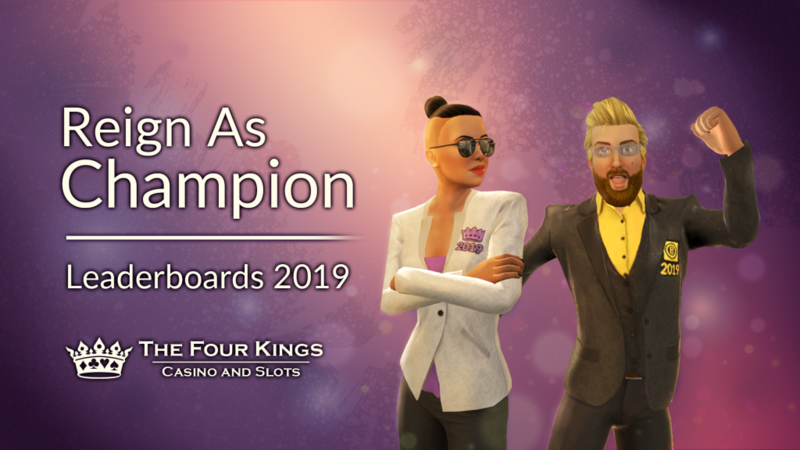 We’re happy with what we accomplished in 2018 for the Four Kings Casino & Slots and we plan on making the game even better in the upcoming year. We’ve got lots of exciting things in the pipeline, and while we can’t discuss all of them just yet, we can shed some light on some things to look forward to in 2019. With the New Year, comes an all-new design for the year’s Leaderboard Jackets. Earn your way to the top of the Leaderboards and you’ll receive 2019’s fresh new designs to show off your status! We’ve also got a new slot machine ready to be released very soon. As always, you can expect new rewards and achievements alongside the new slots to give you some fun goals to work towards. Going forward, we’re planning on readjusting the distribution of RP between different types of games, which should improve things for those who prefer to play games other than Poker. And as always, you can expect regular new item releases throughout the year and monthly Jackpot Pack and Lucky Fountain rewards! We’ll leave you with a first look at the new Leaderboard Jackets for 2019! The Top 10 placers for the leaderboard will be the first to rock these exclusive jackets after the current season wraps up at the end of February.